Everyone hates those self-checkouts at grocery stores. In the author’s personal experience (which should be treated as fact at all times), there is always a problem in their use. It’s either a produce identification problem, an unrecognized credit card problem, or plain old machine-turning-against-its-master chaos. CVS seems to be at the forefront of myopic checkout experiences in DC. Perhaps the quicker the customer thinks the purchase will be, the longer and more painful the actual experience ultimately is. I thought with this knowledge I was prepared to go to CVS for some milk. I actively stopped myself from expecting the trip to be fast. I stood in the line for checkout with a real live employee, knowing better than to go to the shorter self-checkout line. The man behind me, a scholarly type with a sweater and headed-towards-shaggy graying hair, nodded to me and opined, Soon there’ll be no people at all. I gave a half smile and a shrug, the DC equivilent of I hear you but I’m not going to engage you. After waiting around for some time on one customer in front of me, I noticed that this man had come to a decision. He decided not to wait anymore, but instead to walk out of the store with his arms still full of merchandise. I was very intrigued–this was my first real shoplifting experience. I saw him get into his Lexus SUV, complete with Obama bumper sticker and golden retriever in the backseat. If CVS can drive a supposedly upstanding citizen to petty thievery, what’s next?! What indeed? 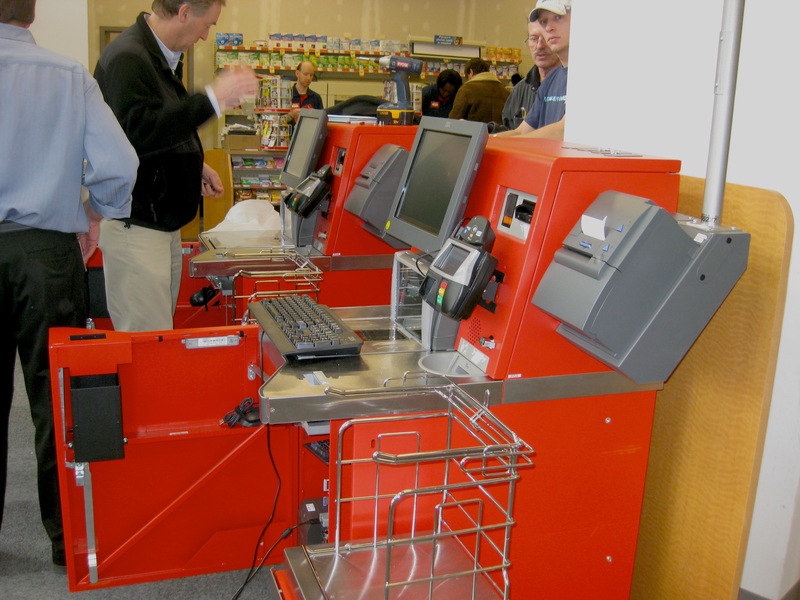 What has been your self-checkout experience? Update: The Washington Post has obviously read my post, rushed their own story to the presses, and brings up a pitiful re-write here. i’m with you on using the perfectly effective method of real live person checkout. self-checkout is yet another example of how technological progress slowly but steadily isolates us..